Surname Saturday: Today’s Surname Saturday post takes a look at the HARRISON family, who lived in Cambridgeshire during the 18th Century. 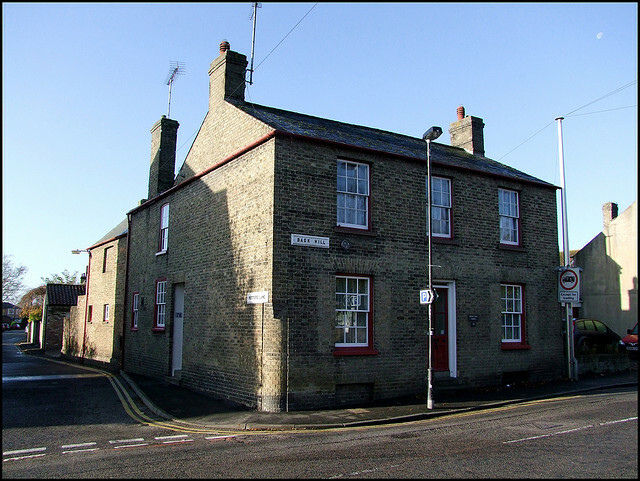 This week’s Surname Saturday themed post looks at the Harrison family who have lived in the Cambridgeshire village of Little Downham since at least the 18th century. The most recent brush with the Harrison family is through my Great x 4 Grandmother, Fanny Harrison – often also named ‘Frances’. She first appears in the village of Little Downham in Cambridgeshire in 1802, and was the fifth of eight children to Richard and Esther. Fanny married Robert Tingey on 17th December 1820 at the Little Downham parish church. She was illiterate and signed the marriage register with an ‘x’. Robert was about four years older than her. The couple settled down to grow a family of at least 12 children over 28 years. My Great Great Great Grandmother, Mary, was their oldest child, born in 1820. All seems well documented for Fanny and Robert, but when it comes to the 1861 census – right in the middle of a documented run – they’re missing. Both appear in the same street that they were in in 1851, and remain there in 1871, but where did they go for 1861? Searches on Ancestry and FindMyPast have proven unsuccessful, and in my attempt to avoid the simple transcription errors, I’ve also view the entire scanned set of folios for that area. The 1861 census for Ely was destroyed in floods, and unless the couple are hiding under a different surname for a census (which happened for another part of my family), then maybe they were visiting someone and are recorded as so on the now lost Ely census. The mystery continues. Fast forward for a bit to about 1974, and my sister’s baby record book. In this keepsake is a family tree. This was probably the first family tree I ever saw (although not the one that got me into family history), and noted on it, is a mystery Harrison relative as my paternal great grandmother. A mystery and erroneous Harrison relative appears too recent in this tree from my sister’s baby keepsake book from 1974. This Harrison appearance was two generations too late, and the role here belongs to Daisy Burnell. 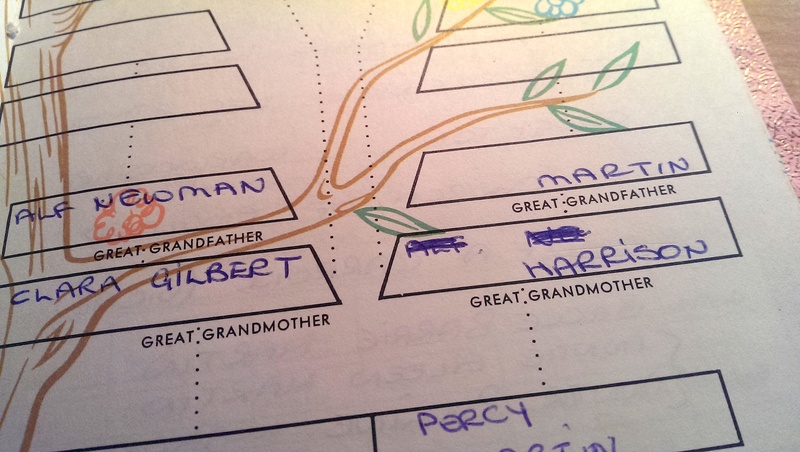 Whilst the appearance of an error here is a red herring, it does at least suggest that the knowledge of a Harrison connection was there, handed down the family. Let’s head back in time again, to Fanny’s parents – who appear to have been Richard Harrison (b.c.1770) and Esther (b.c.1772, d.c.1826). Richard’s parents (Fanny’s grandparents, and my 6x Great Grandparents), appear to have been William Harrison (bc.1746, d.c Nov 1819) and Margaret Granger (d.c. March 1798). I’ve yet to locate their marriage, but they themselves became parents in about 1764, when the first of their eventual nine children (William) was born. Of this group of children, you’ll notice that the second child (a son) has fortunately been given the maiden name of his mother as his first name. With it being unusual, it makes him fairly easy to spot in records, and even turns up in google search results. 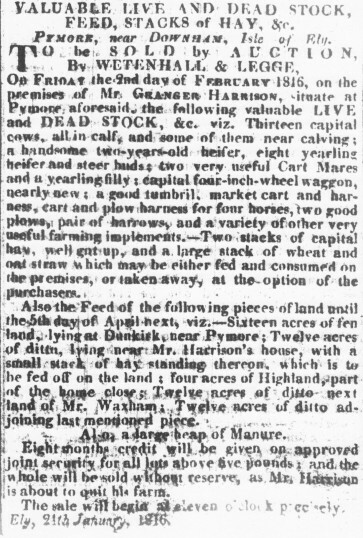 Come 2nd February 1816, Granger Harrison, who now appears to be living in the nearby hamlet of Pymoor, but ‘is about to quit his farm’, is having a live and dead stock auction. Everything from standing crops, to land, to animals through to a ‘large heap of manure’ is listed for sale in this notice published in an edition of the Cambridge Chronicle. A Sale Notice for Dead and Live Stock belonging to Granger Harrison in 1816. Click image for original. It seems that Granger probably remained in Little Downham, where his grandchildren were baptised. One of which, was also named Granger Harrison (b.c.1841, d.1910) – and who is equally blessed with turning up in census returns and search results. This Granger Harrison is my own 2nd Cousin, 5 times removed… so pretty darn distant.. but with my own connection to the Harrison family being a little distant, and entirely photo-less, I’ll cast the net wide. Here, Granger junior appears on the online family tree of Pete Bradshaw and Wendy Often. The site seems like it hasn’t been updated for a while, but I’ve sent them an email in a bid to expand my Harrison tree further. If you have Harrison, Tingey, or Granger ancestors, drop me a line! Guest blogger Jane Freeman writes about using local history sources in print and online to research her Stretham roots. Ooooh, this is a bit scary …. my first “guest” blog. Let’s start with the fact that I’m nearly related to Andrew, via a chap called Francis Yarrow, of Little Thetford, who married Anne Langford in Stretham, back in the mists of time. So, Andrew & I are related in a rather tenuous way best described by my maternal grandmother as “their cat ran over our doorstep”. My maternal grandmother, that is, who came from Stretham, and whose wedding photo started me on my genealogical travellings. Kate Langford was born in 1889 and left the village, as girls her age did, to go into service. Her brothers mostly stayed there and my visits to Stretham as a child were to see “Uncle Bill”, her older brother, by then a widower living with two of his step-daughters. Cis & Ethel – one of them was an excellent cook and to this day I remember her mince pies & sausage rolls at Christmas! 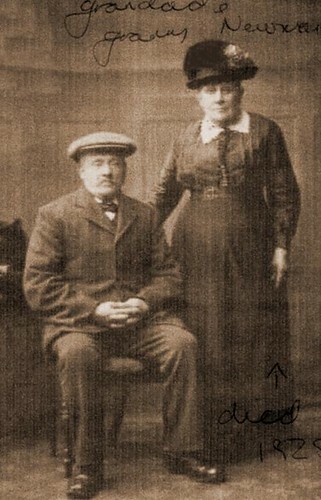 These are the kind of memories which I most like about family history; collecting names and occupations is fine, and satisfying in its own way, but I like to make them into “real” people again and this part of my research is being aided and abetted at the moment by the British Newspaper Archives. A brilliant resource, albeit slightly expensive – its Australian counterpart “Trove” is free. But I digress: my latest find was in the Chelmsford Chronicle, May 1844, under the heading “Awfully destructive fire at Stretham”, which described a widespread fire in the village affecting “not fewer than 25 houses, &c………including habitations of wealthy agriculturists and humble labourers….” (see below for transcription of the full article). Although these articles are very useful in telling one who was around at the time, the writing of them also fascinates me. They didn’t have photographs, of course, to show the destruction so the journalists had only words to use; and how well did they use them. More up to date, but every bit as informative, is “Stretham: A Feast of Memories” by the late Beatrice Stevens. This book gives a portrait of life in the village in the early 20th century and is an absolute gold-mine of detail. The Cambridgeshire library has a number of copies and I recommend it highly for those who have an interest in the village! In its pages I discovered that Uncle Bill’s step-son emigrated to Canada, returning a few years later to fight in the Great War (wherein he was wounded and lost an eye – in the Ely Standard, that one) and returned once more to Stretham, this time with his wife. Because of these clues I went to the Outgoing Passenger Lists on FindMyPast, and thence to the Canadian Library & Archives for his Attestation Papers. Never mind that I’m not at all related to him – I just had to know what happened to him. He sailed on the “Tunisian” to Halifax, Nova Scotia, leaving Liverpool three days after the 1911 census, and subsequently joined the Canadian Mounted Rifles when the Great War broke out. So, while I couldn’t live without the census and parish registers, it’s the “off-piste” information which I enjoy most of all; the only problem is that I get so easily side-tracked – I mean, what’s not to like about some of the old adverts or, my particular favourite, seeing articles in the Cambridge papers of the late 19th/early 20th century which are complaining about traffic chaos! One of the most awful fires which it was ever our province to record took place Wednesday week, at Stretham, near Ely. The destruction of property is enormous; and when we say that not fewer than 25 houses, &c. have been razed to the ground, including habitations of wealthy agriculturists and humble labourers, the reader will imagine for himself the extent of misery which must be the consequence of this lamentable visitation. The fire originated in small hovel adjoining the blacksmith’s shop of Mr. John Westby. It is supposed that some sparks of hot iron were the immediate cause of the catastrophe, but this does not quite clearly appear. At any rate, about one o’clock in the day the hovel was discovered to be in flames; and although assistance was hand, and the fire seemed at first but trifling, so dry were the materials of which the hovel was composed that it was very soon enveloped in flames, which communicated with Mr. Westbv’s house on one side, and Mr. Wright’s stack-yard the other. No sooner were Mr. Wright’s extensive and well-stored premises seized upon by the devouring element, than the utmost alarm for the safety of the village was entertained. Nor was this alarm unfounded, for the flames spread with such frightful rapidity, on both sides of the street, that in a little more than an hour from the time of their breaking out twenty-five occupations, extending over about fifteen acres of ground were in a blaze. To describe the scene would be impossible. The reader will conceive the terrible fright and disorder which prevailed, and the awful character of the destruction going on. So wonderfully rapid was the spread of the names, and so great the heat emanating from the immense mass of burning materials, that many those who fancied their premises secure when the fire first broke out, and consequently neglected to take care their own furniture, clothes, &c. were unable to secure a particle. Some have lost every chip and every rag, save the garments they happened to have on at the time. There is no engine at Stretham. About two o’clock the Haddenham engine arrived, and to the good use made of it, under the most active and energetic directions of the Rev. S. Banks, incumbent of Haddenham, may be attributed the saving of great part of the village. On one side of the street, the progress of the flames was arrested at a cow-lodge, belonging to Mr. Hazel, and the other side the yard of the public-house, next Messrs. Senet and Graves’s premises. In order that the reader may form an idea the extent of damage done by this destructive conflagration, we will give a list of the premises burnt. The hovel in which the fire originated. John Westby, blacksmith.—House, furniture, and clothes destroyed. Mr. Boultentarf, miller.—House, furniture, out-buildings, hay, &c.
Mr. Wright, farmer.—Mr. Wright’s premises occupy both sides the street; at present we are describing the property on the south, but we include Mr. Wright’s total loss. Two barns, stables, cart-lodges, 300 coombs of wheat, 4 wheat stacks, 3 hay stacks, 2 straw stacks, a large number of pigs and fowls, &c. destroyed. House saved. Mr. Coy, farmer.—Dwelling-house, new barn, granary, stables, machines, wagons, out-buildings, wheat stack, beanstack, hay stack, straw stack, about 12 pigs, fowls, &c.
Mr. Murfitt.—House, furniture, barn, stables, hay, &c.
Mr. Lester, butcher.—House, furniture, clothes, stables, cart, five £5 notes, and 40s. in silver. Mr. Jackson.—House, barn, hay stable, & building in the yard. Mr. S. Wright.—House, bam, stables, hay stack, wheat, peas, and beans. Mr. Philips, baker.—House, furniture, clothes, stock-in-trade, and in fact every thing. Mr. John Wheeler, shoemaker and brewer.—House, furniture, stock in trade, warehouse, &c.
Mr. Hazel.—Cow-lodge. Here the fire was stopped on this side of the street. Mr. R. Wheeler.—House and out-buildings. Mr. Gibbons, shoemaker.—House, furniture, stock in trade, and every thing. Mr. Langford, linen-draper.—House, furniture, stocktrade, and every thing. Mr. T. Grainger farmer.—Barn, stables, every outbuilding, haystack, straw stack, 30 coomb of beans, about 40 coomb oats, 14 pigs, a quantity of fowls, &c. Mr. Grainger’s barn was the largest the county: nothing but the walls are left, and so intense was the heat that the brickwork seems in some places to have been almost molten. The house was saved. Mr. L Langford – House, stable, barn & other buildings. Mr. Dring, veterinary surgeon – House and furniture. Messrs. Senet and Graves.—House, barn, and stables. It will be understood from the foregoing that the desolation is heart-rending. The Church was made the receptacle of the furniture, &c. which could saved: and as to the numerous persons deprived of house and home, they were accommodated as well as circumstances would admit, and every attention paid to them by the clergyman and their neighbours. Two engines from Ely were present: and the Superintendent and some men of the isle Ely constabulary rendered great service in the prevention of depredations. It is of course difficult to speak with any thing like accuracy but it has been estimated at between £15,000 and £20,000, a great portion of the property being, we fear, uninsured.— Cambridge Chronicle. Author Jane FreemanPosted on February 7, 2013 February 3, 2013 Categories StrethamTags Anne Langford, Beatrice Stevens, British Newspaper Archives, Cambridge Chronicle, Chelmsford Chronicle, emigration, Francis Yarrow, Jane Freeman, Kate Langford, Stretham, Stretham - A Feast Of Memories, Trove4 Comments on Standard or News? 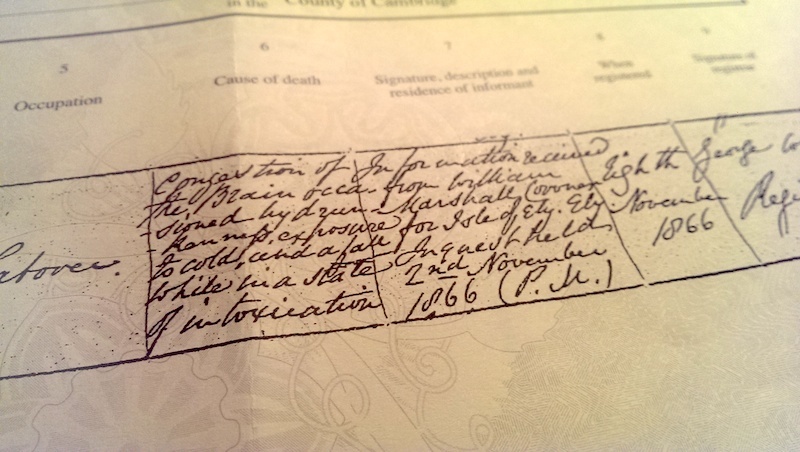 William Bailey died whilst cutting oats in a field in Wicken in 1861. The inquest’s verdict was ‘died by visitation of God’. 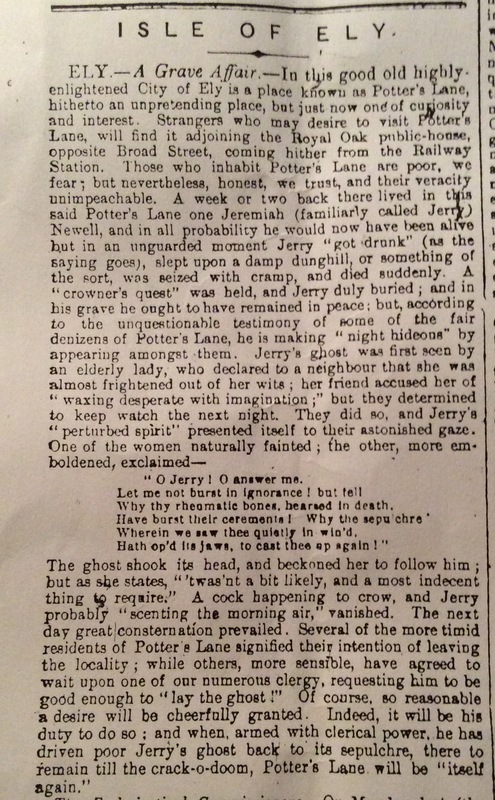 Newspaper report from page 5 of the Cambridge Chronicle, dated 31st August 1861, details the sudden death of labourer William Bailey of Wicken. After an inquest took place, the cause of death was noted as ‘Died by the visitation of God’. Needless to say, the culprit was subsequently not brought to justice.